Fashionotes - #Trending Tutorial: Turkey Time! Browse: Home / Beauty / #Trending Tutorial: Turkey Time! Get into the holiday spirit with this cute and easy festive nail idea! 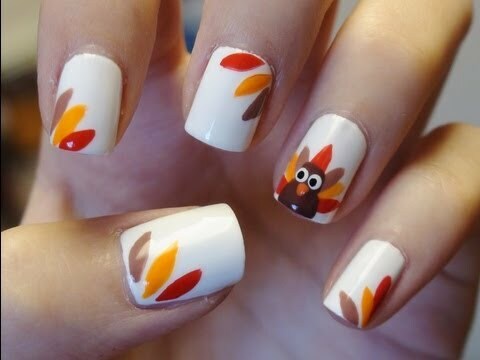 With turkeys the main centrepiece to many dinners across the U.S. today, celebrate the iconic dish with a fun nail art tutorial from YouTube beauty guru turned blogger, MissJenFabulous. Jen brings us new cute and creative nail designs on the regular, along with giveaways, hauls and makeup tutorials. Her popular channel has over 160,000 subscribers and 10 millions views. Beauty vlogging led to her blog, Polish and Pearls, which focuses on beauty, fashion and and her glamorous life! Start with a base coat – you can be creative on color, but Jen’s gone with white – any easy way to ensure your fall colors pop! Use nail stripers to help with the intricate feather details – dip your first one in red and make a large vertical feather. Then make two very small yellow feathers coming out diagonally from the top of your red feather. In between these colors, add a brown feather on each side. Add another red feather to each side, horizontally on the top of your nail. To create the body of your turkey, use a brown nail polish and regular brush to fill in the area where all of the feathers meet. Take that same brown color and create a small head on top of the body. Using a dotting tool create the eyes and beak with white, black and orange colors. For the rest of your nails, use the same white color as a base. Create your own pattern of leaf designs with the brown, yellow and red colors, or whatever warm autumn tones you like. When dry, finish off the look with a top coat.